The rooftop-solar company SolarCity said Wednesday it has been forced to eliminate more than 550 jobs in Nevada because of the new net metering rate approved by the state Public Utilities Commission on Dec. 22. 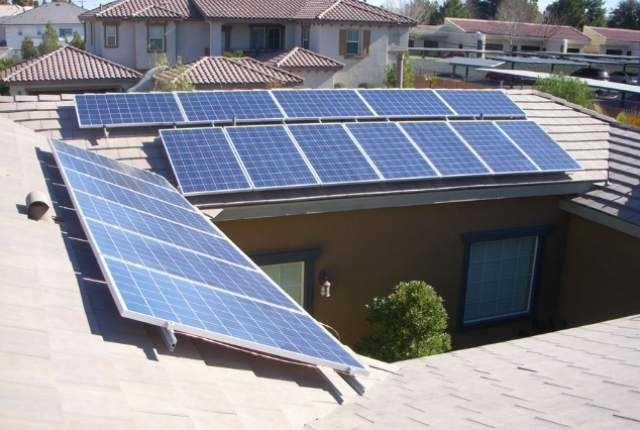 CARSON CITY — The rooftop-solar company SolarCity said Wednesday it has been forced to eliminate more than 550 jobs in Nevada because of the new net metering rate approved by the state Public Utilities Commission on Dec. 22. Where possible, the company said it will relocate affected employees to “business-friendly” states. The PUC’s decision to change the net metering rules “to punish existing solar customers after the state encouraged them to go solar with rebates is particularly callous” and leaves Nevadans to question whether the state would ever place the financial security of regular citizens above the financial interests of NV Energy, the company said in a statement. Sandoval, in an interview in his office, took issue with several statements made by Rive, noting that he reached out to the solar executive on Christmas Eve without success. Sandoval also asked what Rive means by his “do the right thing” statement, saying that he has not interfered in the work of the PUC because it would be improper for him to do so. Sandoval appointed the three commissioners but does not get involved in their reviews, anymore than he does with the Nevada Gaming Commission or other appointed boards. Sandoval said he signed net metering bills passed by the Legislature and noted that his Office of Economic Development provided $1.2 million to SolarCity so it could open offices in Las Vegas in 2014. “If he is asking me to do the right thing, I don’t know if there has ever been a better friend of rooftop solar than me,” Sandoval said. Efforts by the solar industry to increase the net metering cap beyond 3 percent in the 2015 session failed and the Nevada Legislature passed a bill instead asking the PUC to consider the issue. Rive testified in support of the 2015 legislation moving the net metering review to the PUC, Sandoval said. Requests for reconsideration are expected to be filed on the decision. The decision can also be appealed to the state District Court. Sandoval also asked SolarCity to allow the state’s Rapid Response Team to come to the company’s offices to provide job opportunities to employees who are being laid off. “I am hopeful that SolarCity will cooperate with the Rapid Response Team and provide them with the names of individuals and an opportunity to meet with them to help them out,” he said. Public Utilities Commissioner David Noble will hold a hearing Thursday on two motions seeking to delay the new rates that already took effect Jan. 1 for all rooftop solar customers. A final decision on a stay will be made Jan. 13. PUC staff has recommended the request for a stay be denied. SolarCity also has closed a training center in west Las Vegas, which it opened a little over a month ago. But Sandoval said that SolarCity opened the facility knowing that the PUC would be deciding the issue by the end of 2015. Net metering customers of Nevada Power, part of NV Energy, have seen their monthly service charge climb to $17.90 from $12.75 under the new tariff. The monthly service charge will continue to ratchet up, reaching a rate of $38.51 by Jan. 1, 2020. Credits for excess generation from rooftop solar systems also will decline over the next four years. Net metering allows rooftop solar customers to receive a credit for the excess power their systems generate. There are 14,832 interconnected net metering customers at Nevada Power Co. in Southern Nevada, and 2,423 customers with Sierra Pacific in Northern Nevada.